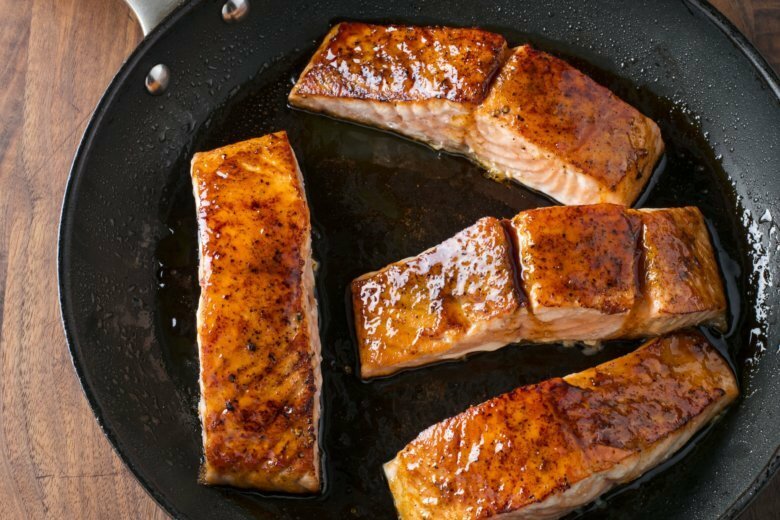 Pairing perfectly roasted salmon with a spiced-up honey-lime glaze required a cooking technique all its own. Slashing the skin encouraged it to render and crisp quickly, but we also needed to give the flesh a strong, flavorful crust that would stand up to (as well as hold on to) a thick coating of glaze. Applying a rub of cornstarch and brown sugar to the flesh and searing it in a hot skillet provided that browned crust and firm texture on the double. Once flipped, the skin side needed just a minute to crisp. We spooned the thickened glaze over the fillets and transferred the skillet to a moderate oven where our salmon hit its target temperature in less than 10 minutes. Glossy and appealingly sweet-tart, these fillets were an easy, satisfying upgrade. To ensure uniform pieces of fish, buy a whole center-cut fillet and cut it into four pieces. If your knife is not sharp enough to cut through the skin easily, try a serrated knife. You will need a 12-inch oven-safe nonstick skillet for this recipe. For the honey-lime glaze: Whisk all ingredients together in small saucepan and simmer over medium-high heat until thickened, about 1 minute; remove from heat and cover to keep warm. For the salmon: Adjust oven rack to middle position and heat oven to 300 F. Combine sugar, salt, cornstarch, and pepper in bowl. Cut salmon crosswise into 4 fillets. Make 3 or 4 shallow slashes diagonally, about 1 inch apart, on skin side of each fillet, being careful not to cut into flesh. Pat salmon dry with paper towels, and rub sugar mixture evenly over flesh side of salmon. Heat oil in 12 inch oven-safe nonstick skillet over medium-high heat until just smoking. Lay salmon flesh side down in skillet and cook until well browned, about 1 minute. Carefully flip salmon and cook on skin side for 1 minute. Off heat, spoon glaze over salmon fillets. Transfer skillet to oven and roast until center is still translucent when checked with tip of paring knife and registers 125 F (for medium-rare), 7 to 10 minutes. Serve. Nutrition information per serving: 364 calories; 123 calories from fat; 14 g fat (2 g saturated; 0 g trans fats); 109 mg cholesterol; 254 mg sodium; 20 g carbohydrate; 0 g fiber; 19 g sugar; 39 g protein.